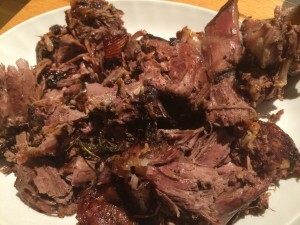 Even though I had a tricky early relationship with lamb, I LOVE this recipe – or, frankly, any recipe that says do a brief bit of preparation and then put everything in the oven for hours. The original Katie Quinn Davies recipe that I used for the eight hour lamb is accompanied by a herby lemon sauce (delicious), but this time I decided to serve it with more traditional trimmings and it work excellently. Preheat the oven to 140°C (fan oven) or 160°C/290°F (fan oven) or 320°C/gas mark 2½. Place the onion quarter and the halved garlic bulbs in the middle of a roasting tin and scatter over the sprigs from one bunch of rosemary. Place the lamb on top. Pour a “glug” of olive oil into your hands. Rub them together, then rub all over the lamb. Using a small, sharp knife make 12 slits (about 2.5cm deep) in the meat. Push two garlic halves into each of the slits, then but six rosemary sprigs in half and poke one into each slit with the garlic. Season the lamb generously with salt and pepper and drizzle with a little more olive oil. Cover the meat loosely with foil, tucking it in around the inside of the tray. Roast in the oven for eight hours. Check from time to time and if it’s looking a little dry, add a splash of water or white wine. Chill, read the paper, go for a long walk, tidy up that spare room. Whatever. About seven hours in, start on whatever vegetables, sauces etc you have chosen. When the lamb is cooked, remove it from the oven and let it rest for 20 minutes, while you whirl like a dervish around the kitchen getting everything else ready. Melt the butter in heavy based pan, add the onions and cook over a low heat until golden and soft. Continue cooking with a lid on, until the onions are brown and soft enough to crush between your fingers (you can prepare this bit ahead, but beware of then eating all the sweet, sticky onions). Stir in the flour and cook for a few minutes, then pour in the liquids. Season with salt and pepper and the Worcestershire sauce and bring to the boil. Turn down the heat and leave for about 15 minutes, stirring from time to time. I bought the magnificent leg of lamb from Muddy Boots, but it was way too big so I minced the leftovers, put it all in the freezer and then turned it into a lovely moussaka. I ate quite a few slices of the griddled aubergine before they made it into the dish. Missy B, on the other hand, managed to pick out every trace of aubergine from her portion. 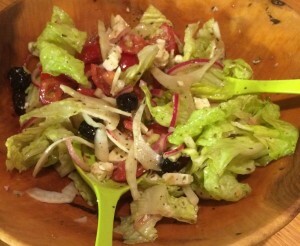 In keeping with the Greek theme, I dusted off an old favourite recipe, Nigella Lawson’s Ultimate Greek salad. This needs as little bit of forward planning, as you marinade your red onions for a couple of hours, but that aside, it is easy and fabulous. Hadn’t read this when you phoned! Sounds absolutely wonderful but how do you think G’pa Battenburg would react? Any ideas for substituting garlic – ha.